If someone were to ask me what would be your ideal weather for Christmas, my answer would have fitted exactly what we had. I couldn’t have asked for a better Christmas present than the perfect cloudless skies and warm winter sunshine we had last week. My parents were here from the UK for Christmas and the three of us sat outside having a picnic lunch on Christmas Day. Who’d have thought that possible! 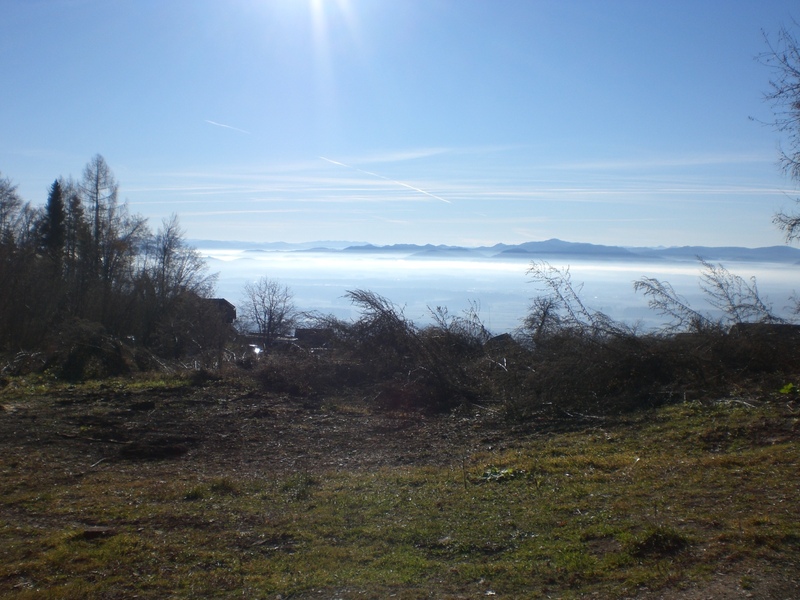 However, not all the country were so lucky as many places were, again, shrouded in fog. This is the view on Boxing Day looking down from Možjanca, near Preddvor. 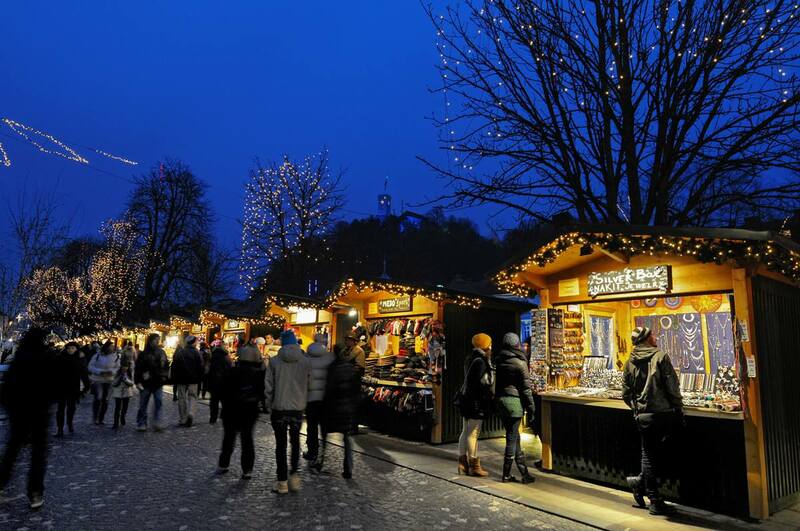 During my parent’s visit we packed in plenty of sights including a trip to the Christmas market in Ljubljana. 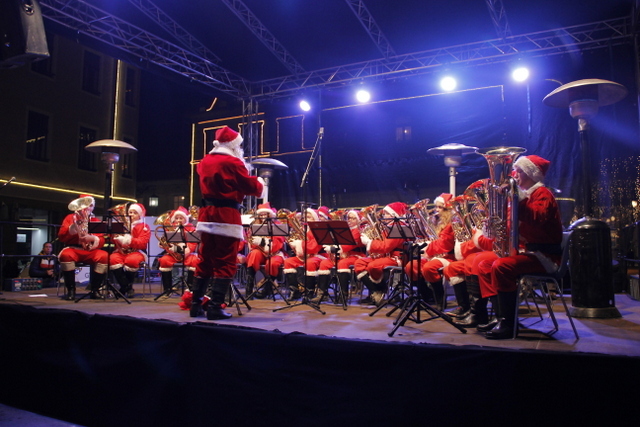 A visit to Kranj to watch the very popular annual Christmas tuba concert (tuba božički) – to get us in the festive mood. On Christmas Day we visited a tourist farm (more about that next week), visited friends, watched the Ana Snežna street show in the old town of Radovljica, and finished the day with a meal at Kunstelj Inn in Radovljica. 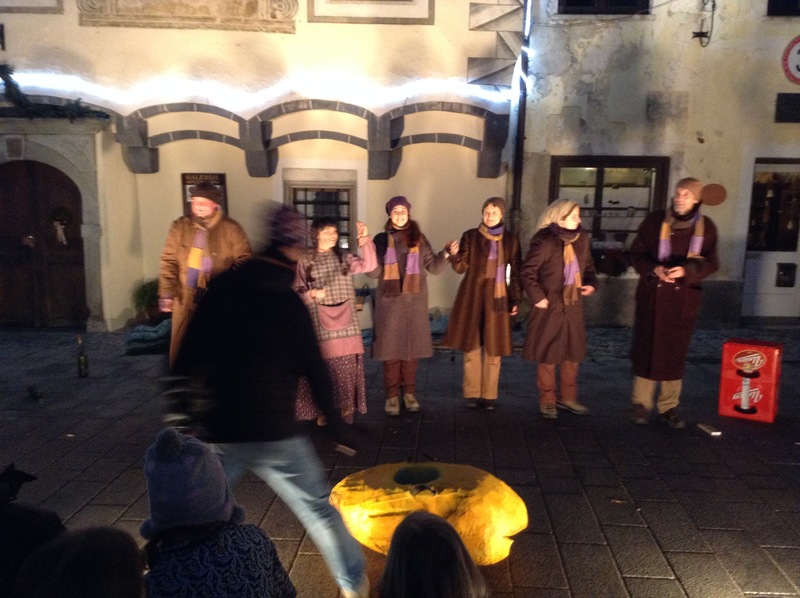 If you haven’t already decided how and where to see in the new year, here are some ideas of what’s on in Radovljica and the surroundings and also further afield. If food, and of course drink, is on your mind, then look to one of the Taste Radol’ca restaurants, though hurry as some are already fully booked. Amongst others, Kunstelj Inn is offering a 4-course menu of local food for 33 euros, Grajska gostilnica is offering a 6-course New Year’s Eve menu for just 37 euros per person and Gostišče Tulipan has a 4-course menu with live music for 28 euros per person. People often ask me how I come up with so many ideas for what to write about and if I ever run out of ideas. Actually, sometimes I still have too many ideas so, if you keep reading, I’ll keep writing, and may the journey continue to make 2016 an even more successful year for Adele in Slovenia! I wish all readers a very, very Happy & Healthy New Year! « A Green Christmas and a Winter Fairytale! Rain this morning. Warmer though….42 this morning. What weather/ temps could we expect in February? Probably difficult question …bit like asking how long is a piece of string,,,,but…would you expect rain or snow most days? Is beginning of March any better? Slovenia just looks so beautiful and we like the snow / hiking etc. Hi Heather, yes, rather difficult to say, very much a case of a long piece of string and all that! If you like the snow, and don’t mind the cold, then you could come in winter, though obviously you will be more restricted as to what, and where, you can go. These days weather patterns don’t seem to follow much of a ‘pattern.’ I mean on Christmas Day, less than 2 weeks ago, I was sitting sunning myself on my balcony (yes, really!) then a few days later the snow arrived. When the temperatures are low, the snow can last for a couple of months, or it could warm up a bit and the snow turn to rain – as it forecast for this weekend, though possibly not here in the north-west. So, sorry I really can’t be of much more help in terms of weather in February – probably (one of) the hardest months to call. Of course, summer it won’t be – we at least know that!